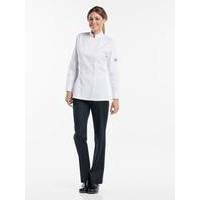 This ultimate Tailored Fit Chaud Devant Lady Chef Jacket Comfort White was specially designed for ladies. Besides the elegant tailored fit, the female version is identical to our Comfort and Roma jacket. 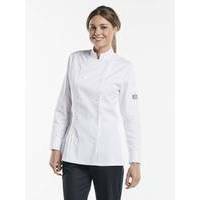 This means: a double panel with visible snap fasteners and an elegantly finished cuff. The side splits provide ample freedom of movement. The Chaud Devant Comfort Wite Jacket is available in black and white.